MERIDELL - Turmaculus, aka Turmy. The second you say his name, you have people all over, either upset - or a selected few, joyful. Either way, he is quite well known around Neopia, though also very much despised. This fellow is the source of something very important in Neopia - a lovely avatar. We have people that are currently even tracking the times this creature wakes up, to help others and themselves get a nice chance to wake up Turmaculus, and get their poor petpet eaten. Many times though, people do not get their wish. 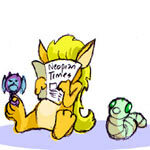 Turmaculus is known to give out gifts, such as books, or small BD items, and sometimes a few Neopoints here and there. But - some might think that we need more methods to attack this sleeping beauty - in chances to better anger him, and have him eat our petpets. Here I have compiled some things, from why the current possibilities should be thoughtfully reconsidered, and/or possibly some new ideas to go along with it! And, remember - now matter how angry or frustrated your siblings may make you - never treat them like you might Turmy :P Good luck with getting the avatar if you haven't received it yet! First, I will add onto possibilities already on the list. 1. "Hit him with a stick" - Are you crazy? My friends, Turmy is not your average 'house pet'! It's like humans being hit with a twig. Yes, it may bother us, but it's nothing more than a brush and we can ignore it. How about something pillow sized? Yes, and harder. A huge brick? Maybe that'll "disturb" him a bit more! 2. "Ring a bell" - Ladies and gentlemen, big creatures like him sleep verrry deeply. A ring is nothing more than small background music for his adventurous dreams. Maybe stick your fingers in his ears! OK, eww, no. Maybe a bell as big as the Liberty bell - yes, that might do. 5. "Blow your nose" - I think that should be changed to, "Blow your nose on him" That'll get him going! 6. "Sneeze" - Once again, get a microphone and this might just do it! Just please... don't forget to wipe up the mic afterwards. 7. "Dump cold water on him" - If you get a huggeee bucket, or something bigger them him to dump it all, this'll be a sure way to get this sleeping beast up. Or, if not water - mud, or mucus.. anything disturbing and disgusting might pull the trigger! 8. "Scream" - This mic comes in handy way too often! Just get an opera singer and do the highest pitch possible. I think EVERYONE will want to cover their ears on this one. What do people on the AC use, and what do some of them get in return? I went out and asked them, and here are few of the responses. Okay, so obviously we have a few different replies here.. and hopefully after all this beating up and bothering this 'little' guy, it wakes him up eventually! Now, I have the avatar already, but I remember I always loved dumping water on him. From the current list by itself, it seems like the most 'bothering' of them all. Well, I know I would be SUPER mad if someone came and did that to me! Last but not least, I added a few simple ones that could be added. 1. Tickle him! - Oh believe me, that can REALLY wake someone up easily. 2. Pinch him - Haha, that would be a bit odd, but it might just do it. 3. Yell, "FIRE!" - Okay, that might get you trampled... erm... be careful. 4. Pillow fight! - A more gentle way of getting him up, hopefully. I hope you had fun reading this =) Even if you have the avatar already - you probably remember being one of those little people who use to ask when Turmac was waking up. Yes... we all went through it! Or... maybe you got the avatar on your first try *rambles on about how some people are too lucky* If you don't have the avatar yet, I hope you get it soon! I understand your pain there, dears. It's annoying. -.- Thankfully, I have the avatar already (I actually got it almost the first month it came out, surprisingly) but I still visit Turmy on a weekly basis, checking up on the old thing. :P So - whatever you may do, make wise decisions and you will get it some day! !